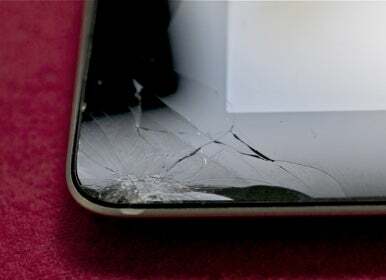 After having more than a dozen iOS devices entrusted to my care I experienced the “Ah drat!” moment that all iPhone, iPod touch, and iPad owners dread—gravity gets its grip on the device, it tumbles to the ground, and CRRRRRAAAACKKK goes the display. My new third-generation iPad managed to slip off my desk and glance off the one metal object on my office's carpeted floor. That glancing blow was enough to shatter a section of the iPad’s glass display and send cracks across the bottom-left corner. He went on to explain that you can’t use iFixit’s iPad 2 replacement front panel because its connector and cable length is different from what you find in the third-generation iPad. I asked if something like windshield resin might do the trick and he said that given that the crack wasn’t over the display itself but rather in a corner it was worth a try if I didn’t mind a less-than-perfect looking screen. Regrettably I did, so it was on to the next step. With home-made remedies out of the question it was time to see the wizard—or, at least, the Genius—at the localish Apple Store. In the early days of The Store you could waltz in, pull up a stool, and a Genius would get to you in short order. Now that Apple products are so popular and so many people have them, walking in isn’t your best option. Instead, you make an appointment via Apple’s Genius Bar web page. In the U.S,. you choose the state in which you live and then select a store within that state. In the next screen, select the product you’d like to speak with the Genius about—iPad, in my case—and click Next. A page appears where you can choose a day and time for your visit. This I did; I then proceeded to prepare my iPad for its time in the Apple Genius's care. Much as I’m certain that each and every person who works at Apple is a trustworthy soul, I’m just paranoid enough to be concerned that the truck bearing my old data-packed iPad might be highjacked by aliens who would use my personal information to tweet inappropriate images of South American livestock under my name. To avoid that, I resolved to wipe my iPad of information. Doing that is simple. Just jack the iPad into your Mac, select it in iTunes’ Source list, and in the General tab to the right, click on the Restore button. iTunes will download (if necessary) the latest version of the iOS and install it on the iPad. You then have the option to set up your iPad as a new device (thus putting it in a condition similar to how it originally came out of the box). That's exactly what I did. And so, Friday, it was off to see the Genius in not-so-terribly-far-away Monterey, California. I met the greeter at the door, told her that I was there to see the Genius: She found my name on her iPad, tapped it to indicate I was on the premises, and suggested I hover near (but not right in front of, please) the Genius bar in the back of the store. I did, waiting for a couple of minutes. Albert (not his real name), the very nice Genius, called my name, walked over, asked me what the problem was, and I opened the box. And off we went. Thrilling as our banter was, I’ll just mention a couple of details that might help you in a similar situation. Swap, not repair: When you bring in one of these devices, Apple doesn’t take it, give you a ticket, and tell you to come back in a week after Joe in the back fixes it. Instead, you’re given a replacement. Oftentimes this is a refurbished model—one that’s been repaired and is offered with the same warranty as a new one. In my case, Albert said it was unlikely that it was a refurb as the third-generation iPads are so new, but he couldn’t swear to it as store employees aren’t told what’s inside these replacement models. It’s not cheap: I had a 32GB 4G AT&T model, which retails for $729. The replacement cost of the iPad is $299 plus tax. No, you can’t switch to a Verizon model: I pre-ordered my iPad within minutes of the thing going on sale and, because I’ve always done so, chose the AT&T model. Regrettably, at the time, I didn’t know that AT&T was going to drag its feet in regard to tethering (nor that Verizon would offer tethering for free). Rather than cancel the order and get back in the now-longer queue, I stuck with the AT&T model. Figuring this was as good a time as any to rectify my mistake, I asked about getting the Verizon model instead. This has always been Apple’s policy, even back to the days of the iPod. So I wasn’t surprised but thought I’d give it a shot. If only I’d had AppleCare: For $99 you can purchase AppleCare+ for your iPad. That gives you an additional year of coverage (so, two years instead of one) and it also includes two accidental damage incidents (which is what the + indicates). So, as in my case, if the iPad takes a tumble and the screen cracks, the replacement cost is $49 rather than $299. I could still get AppleCare, but…: Albert offered me the opportunity to purchase AppleCare for my replacement iPad, but with a condition. Although I could pay the same $99 for the AppleCare, one of those accidental damage incidents would be wiped out due to the original iPad’s injury. And with that, Albert swapped out the SIM card in my damaged iPad with the card in the new model, rewrapped the iPad in its plastic sheet, placed it in the box I brought, swiped my credit card, and asked if there was anything else he could help me with. All in all, it took 10 minutes to conduct our business. While I’m not happy dropping another $300 on my third-generation iPad, I have no one to blame but myself. The replacement cost stung, but Apple’s not in the business of throwing free iPads at everyone who walks by the store. I appreciate that the company has made replacing these devices easy and that they’ve trained their employees to be courteous and professional. On a bad-luck Friday the 13th, I could have experienced far worse.